Look, we all know that times are tough right now. Dropping $250 for a portable travel vaporizer is a hard pill to swallow. But is dropping $90 on a discount vape the best way to get a deal? 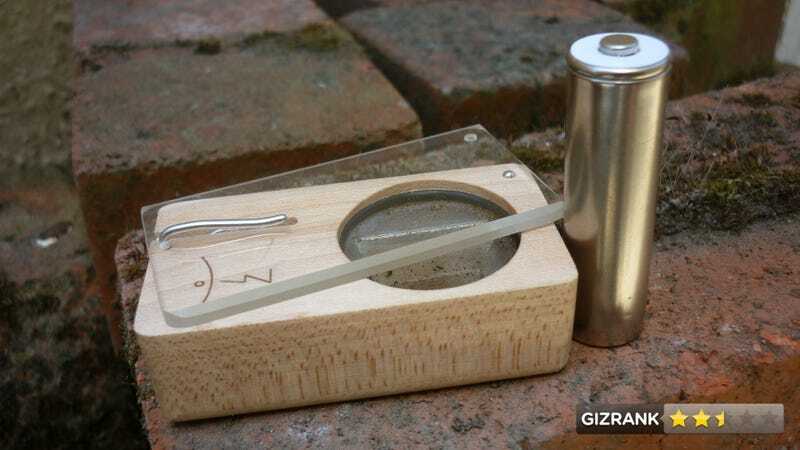 A battery-powered portable vaporizer what looks like a term project for a high school shop class. People who want to own a travel vaporizer with none of the modern conveniences found on other models. Possibly the Amish. It's a small wooden box with four holes: a draw hole, a vent, a battery receiver and the materials chamber, which is covered with a clear piece of plastic. Load up the tray, close the plastic cover, jam the positive end of the AA NiMh battery into the side of the block to complete the circuit and heat the tray. How hot the tray gets, or how quickly the battery is discharging—that's anyone's guess. It is effective. A little herb goes a long way in a Launch box. Pressing your lips against pine multiple times a day really dries them out. Chap-Stick helps, but it gets the mouth hole all slimy (frickin' gross when sharing). The batteries will short at the drop of a hat, so always keep their black rubber helmets on, unless they're being actively used. Don't carry them in a pocket with loose change, or really anything that conducts a charge. The only way to tell your screen is getting too hot is by the presence of smoke. Be careful with the screen trough. If you break it, you'll have to replace the entire unit. It seems like discharging a battery through an unregulated circuit is neither the safest nor the best method. If you can't afford the Pax, and you don't want to fire up a VaporGenie, and you can't find rolling papers, an aluminum can, or an apple—and you don't mind paying $88 for about five bucks worth of parts—then yes, yes you should. • Dimensions: 2.5" x 1.75" x .75"